RG6 dualshield/tri shield & quad shield connectors | Belcom Cables Ltd.
LinearX3 F/BNC/RCA Compression Tool (Adjustable) with four RTQ™ WeatherProof™ F-ConnectorsThe LinearX3 adds an adjustability feature and is designed for F/BNC/RCA connectors. The post can be raised or lowered to accommodate different sizes and types of compression connectors. 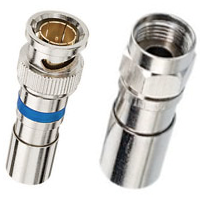 No separate or loose adapters are required for BNC or RCA connectors. 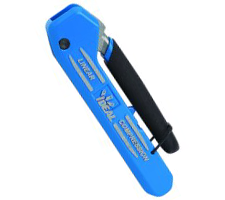 This tool is for installers who work with multiple types of connectors looking for an economical all-in-one product as an alternative to traditional crimping tools. The LinearX3 is designed for installers of CCTV, Audio/Video, and CATV/SATV systems. It is compatible with all IDEAL F/BNC/RCA compression connectors for RG6/RG6 Quad/RG59. • Features • Resources • Compresses 21mm (industry standard) F compression connectors. • Durable and rugged zinc die-cast body with a protective powder coated paint finish. • Captive linear stroke for consistent compression results and easy operation. • Includes 4 RTQ™ RG6/6Quad WeatherProof™ F Compression Connectors. RG-6 Reg/Tri/Quad Compression F-Connector (Bulk of 1000)• Approved for indoor/outdoor use. • All brass construction, nickel plated for superior corrosion resistance. 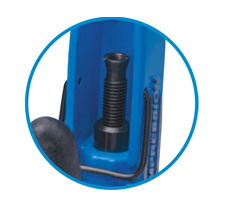 • Plastic adapter sleeve and inner ‘O’ ring provide double protection for a watertight seal.